OCAD University is proud to announce that Assistant Professor Camille Isaacs and Ryan Rice, Delaney Chair in Indigenous Visual Culture are this year’s co-recipients of the BLG Faculty Equity Award. The BLG Faculty Equity Award, sponsored by Borden, Ladner & Gervais (BLG), recognizes distinctive and outstanding work in teaching, pedagogy, research or creative work and service in advancing OCAD U’s mandate in fostering an inclusive, equitable and diverse learning environment inside and/or outside the classroom. Dr. Camille Isaacs teaches in the Faculty of Liberal Arts & Sciences and School of Interdisciplinary Studies. Her teaching load regularly includes courses in Postcolonial Literature, Diasporic Literature and Caribbean Literature where she “privileges the margins” to allow students to pair their own life-experiences and cultures with the literary material under discussion. This directly corresponds to her own significant research practice focusing on the Black Atlantic Region, as well as her work as the chair of Black History Month festivities, where she actively supports students’ success as they prepare for exhibits, workshops and conferences each February. Ryan Rice is serving his second three-year term as Delaney Chair in Indigenous Visual Culture (INVC), which includes teaching, administration, management and researching responsibilities. He has made great strides in strengthening and advancing the INVC BFA program, while establishing an inclusive Indigenous Students Centre for support and services while also contributing to committees, consultations and development opportunities. These have included the Presidential Task Force on Underrepresented Racialized and Indigenous Faculties, the Education and Employment Equity Committee and OCAD U search committees. Throughout the year, Ryan continued to program documentary series Culture Shiftsand hosted the final two Nigig Artists-in-Residence, while also participating in the Provost’s Indigenous Learning Task-Force and the hiring of the university’s Indigenous cluster hire. The pair were publicly celebrated for their achievements by BLG representative Eric Rohrer and OCAD University President Dr. Sara Diamond at Convocation on Tuesday June 12, 2018 at Roy Thomson Hall. Supported by OCAD Student Union and Office of the Vice-Provost, Students & International. Using the 'Surviving the Art School' publication, produced by Collective Creativity (of which Rage is a member) and published by Nottingham Contemporary (UK), as a starting point, the talk and workshop will ask what this visually entails. During this workshop participants can expect to learn and share strategies for decolonising education. Participants are encouraged to bring with them a 'problem' of the institution to collectively strategise and create a surviving the art school toolkit. This workshop is open to students from all disciplines. A presentation of Collective Creativity: a Queer, Trans* Intersex People of Colour artist collective in London UK which aims to create radical, grass roots space for QTIPOC to interrogate the politics of art, in relation to queer identity, institutional racism, and anti-colonialism. CC is dedicated to creating space for conversations that challenge institutional racism and white supremacy within a cultural framework. We are concerned with how we decolonise our art educations, unlearn the histories that replicate the colonial gaze, re-formatting our own art educations and a re-positioning of this canon by re-centring artists and cultural producers of colour. Raju Rage is an interdisciplinary artist who is proactive about using art, education and activism to forge creative survival. Based in London and working beyond, they primarily use their non-conforming body as a vehicle of embodied knowledge; to bridge the gap between dis/connected bodies, theory and practice, text and the body and aesthetics and the political substance. They work in performance, sculpture, soundscapes and moving image, focusing on techniques of resistance and utilising everyday objects and everyday life experiences in communicating narratives around gender, race and culture. They investigate history, memory and trauma, with an emphasis on colonial legacy, its continuation and impact on the body and contemporary diasporan identity. They are an organiser and member of Collective Creativity arts collective. For any accessibility accommodation requests to fully participate in this event, please contact Shamina Chherawala at schherawala@ocadu.ca or 416.977.6000 ext.3840 in advance. Whose Art Counts is a night of presentation and discussion to consider who is and is not included in art and art history. Our speakers will take varied approaches to the subject consider what art is left out of our mainstream culture and what problems do these artists face. Together we will question the cultural canon and broaden ideas of whose art has value. Pamila Matharu is a Toronto-based interdisciplinary artist, educator, and cultural producer. Her practice engages a close reading of the ‘other’ experience; examining issues of identity and representation through socially-engaged art, critical / feminist pedagogy and the minutiae of the everyday. Installation artworks are the result of combined strategies through collage, analogue + new media, printed matter and social practice. She received her BA in Visual Arts and her Bachelor of Education in Fine Arts Education, from York University (Toronto), has exhibited and screened her work, locally, nationally and internationally. Ojo Agi is a Nigerian-Canadian self-taught artist living and working in the GTA. Ojo studied Health Sciences and Women's Studies at the University of Ottawa and is currently taking Continuing Studies courses with OCADU. She studied anti-racist feminisms throughout her undergraduate degree and has a deep interest in applying a social critical lens to contemporary art. For more of her work visit ojoagi.com. Ryan Rice, a Mohawk of Kahnawake, Quebec received a Master of Arts degree in Curatorial Studies from the Center for Curatorial Studies, Bard College, graduated from Concordia University with a Bachelor of Fine Arts and received an Associate of Fine Arts from the Institute of American Indian Arts. He has worked for the past 18 years within the museum/art gallery milieu at various centers including the Iroquois Indian Museum, Indian Art Centre, Carleton University Art Gallery and the Walter Phillips Art Gallery. Rice was also a co-founder and former director of the Aboriginal Curatorial Collective. His exhibitions include ANTHEM: Perspectives on Home and Native Land, Oh So Iroquois, Scout’s Honour, LORE, Hochelaga Revisited, ALTERNATION, Soul Sister: Re-imagining Kateri Tekakwitha and Counting Coup. In August 2014, Rice was appointed the Delaney Chair in Indigenous Visual Culture at OCAD University. Rei Misiri is a Toronto-based multidisciplinary artist and designer migrated from Tirana, Albania. Since 2006, he has been consistently involved in community related urban art projects. As an urban arts youth educator and performer, Rei has had the privilege to spread the discipline of urban arts and dance across Ontario. Moreover, he has extensively worked along leading Canadian urban arts organizations such as Unity Charity, Toronto Crime Stoppers, and The Patch project. Since 2010, he has hosted and curated over 15 integrated urban arts events - providing youth opportunities to preform and compete along some of the world’s highest ranking urban dancers, artists, and DJ’s. Upon graduating from OCAD University with a major in fine arts and a minor in graphic design, Rei plans to pursue a masters in visual arts to further merge urban arts into academia and other professional fields. This event is funded by the OCAD U $1,500 Big Ideas Fund. The fund is sponsored by the Office of Diversity, Equity & Sustainability Initiatives and made possible with generous support from OPSEU Local 576 Unit 1. Read more about Whose Art Counts? 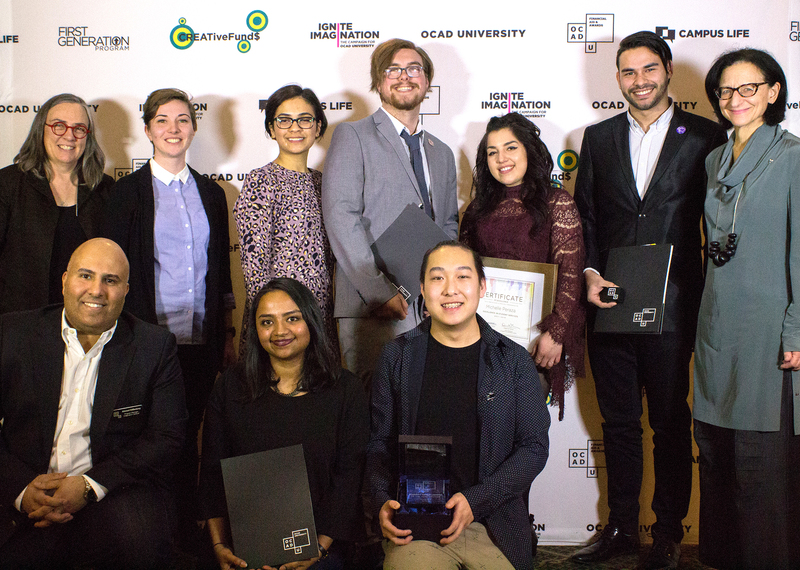 The Diversity & Equity Excellence Awards were handed out at a reception in March to acknowledge OCAD University’s exceptional student leaders and their tremendous contributions to advancing equity at the institution. This year, with generous support from Office of the Vice-President, Academic; Office of the President; and Office of Diversity, Equity & Sustainability Initiatives, the selection committee chose to give out three awards rather than one. The contributions of this year’s winners ranged from advancing equity in OCAD U’s governance and policy through community initiatives in art and design creation and in the learning environment. At the same event, the Peer Mentor Awards were given to students who made outstanding contributions to the Student Mentor Program, demonstrating enthusiasm and positivity while providing helpful advice and support to their student mentees. Tracy Cai and Madison Leeson were recognized by Andre De Freitas, Manager, Financial Aid & Awards, for their excellence in Financial Literacy. They collaborated to produce CreativeFunds, a series of videos that teach students how to manage and budget their finances. Sofy Mesa and Oliver Roberts coordinated a winter clothing drive and soup kitchen community members in need. Tooba Syed took on an active role with Textbooks for Change, coordinating the collection of donated textbooks on campus, repurposed to create social impact and improve the educational landscape for students around the world. The awards celebration was made possible by the First Generation Program; Financial Aid & Awards; Alumni Relations; and the Office of the President. Contributions to Diversity, Equity & Excellence Awards were made by the Student Union; the Office of the Associate Vice-President, Students; the Office of the Vice-President, Academic; the Office of Diversity, Equity & Sustainability Initiatives; and the Office of the President. Artists, this is your chance to show what feminism means to you. From November 10 to December 6, The Learning Zone at OCAD U will exhibit the collaborative creativity of artists reflecting on feminism. For a month, interact within a feminist space that connects artists across ages, mediums and perspectives. Don’t let the word feminism dissuade you. This is an all-inclusive event. GET INVOLVED Artists, email us for more information as we will require some information from you as an artist before the show, including name, school, copyright and redistribution rights. Groups, this is the perfect time and space to host discussions, presentations and events relating to feminism. Submit a date on which you would like to host an event during the exhibit along with a description of it. Submit your interest by November 3rd, and for any further information contact feministfomonomo@gmail.com. A call for the online exhibition will follow so if you can't get it ready for this one. This exhibition is sponsored by WIAprojects at CWSE/OISE University of Toronto, the OCAD University Library’s Learning Zone, OCAD U's Office of Diversity, Equity and Sustainability Issues (ODESI) and the Feminist Art Conference (FAC).